times like these...: Assistant referee... 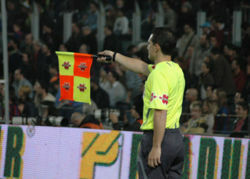 Formerly known as Linesmen..
Assistant referee... Formerly known as Linesmen..
Hehehe... Not a proper linesman since I do not have any assistant referee clothes, flag, or even SHOES.. that's right.. SHOES..
With all the torns of The Sensitive plant (Mimosa pudica L.) or famously known as pokok semalu, hard to keep up with the line but I have too.. The game must go on..